About the Book: Olivia Bevelstoke is spying on her new neighbor. Sure, he's handsome and a bit mysterious, but they say he killed his fiance. Harry Valentine knows that the girl next door is spying on him and he doesn't like it one bit. He hates it when he gets instructions from the war office that he is to spy on a visiting Russian Prince. He really hates it when he finds out that the Prince has set his sights on Olivia and now he must protect her. As Harry starts to spend time with Olivia, he discovers he just might be falling for her himself. Sarah Teenlibrarian Says: What Happens in London is a hilarious regency romance! When I was asking for suggestions for a romance to read for my adult reading materials class, I heard Julia Quinn's name over and over again. While the second book in the Bevelstoke series, I wasn't even aware that it was part of a series and the book can stand perfectly on it's own. The characters are too much fun. Olivia makes lists in her head that pertain to the various situations she finds herself in, which often lead to a funny narration on her part. Olivia and Harry start out disliking each other. It's not even really that they dislike each other, more that they're suspicious of each other. But that soon changes after they talk and get to know each other and their relationship turns to a flirtatious friendship. They talk to each other through their windows and share in the reading of terrible literature with Miss Butterworth and the Mad Baron, which adds another element of fun to the book. They have a witty banter and the book made me laugh out loud on several occasions. The supporting cast of characters is hilarious as well. The Prince is rude and obnoxious, Harry's cousin Sebastian is dramatic and hilarious. This cast of characters is one I would love to spend more time with. When I found out it was part of a series, I had to go back and pick up the first book-I was impressed with the author. 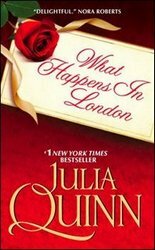 What Happens in London is a RITA Award winner for Best Regency Historical Romance and the Romance Winner on Rusa's 2010 Reading List. Even if you snub romance or historical romance, give this one a try. It's a fast read and full of humor that makes this a very enjoyable read. 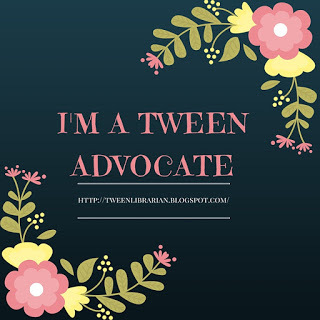 Is There Teen Appeal? Maybe. The book is very funny and the characters are fun. This is an adult romance, so there some steamy scenes. But I know many teens who regularly read adult romance, so if you have readers who enjoy regency fiction or regency romance this might be a good choice. I discovered Julia Quinn last year - like you, her name kept popping up among the recommendations! Her books are delightful and can stand on their own merits, even though they are part of a series. Can't wait to crack that open this weekend! Just got it in at the library. Love this book! Like seriously loved this book and completely agree with everything you said in this review. It was such a fun read and it had me laughing out loud more than once. JQ rocks! I LOVED this book! I'm not up to picking the first book, but I happily got the one with Sebastian as the lead. Can't wait to read it.